The colorful serapes will always be immediately recognized as Mexican. They are very versatile. You can use them as a table cloth, on your wall, on the bed, on the couch or anywhere you wish. There are now even skirts, shorts, shirts and other garments with the serape colors and fabric. For a wedding there are the white and black styles that make it more formal. Check out our serape info page for more details. The rebozo is another beautiful piece that can be used for decorating. 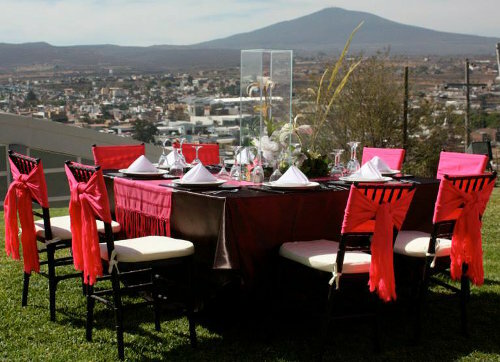 The single color rebozo can be used as bows on chairs, on tables or walls. There are different styles of rebozos which are verey sophisticated and can be used as an accessory in your party attire. The rebozo is making a comeback in today's fashion and after seeing all the amazing designs and ways to wear you will agree that it can be very appealing. 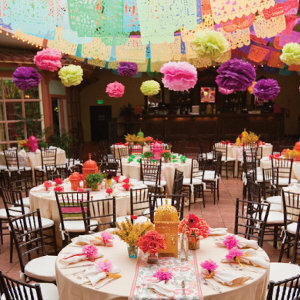 Papel picado and piñatas are great Mexican party decorations. It is literally translated as chopped paper, and it is made with tissue gift wrap ("papel de china" in Spanish). Papel Picado was used to decorate popular festivities in Mexico. First the religious celebrations: day of the dead, Christmas get togethers called "posadas" and Mexican patriotic days such as Cinco de Mayo and Independence Day (September 16th). Today papel picado is very much used for weddings, sweet 15 celebrations (XV años), and Christening (bautizos). Now there is even a commercial use in publicity. Beverage food and other companies use papel picado to show their logos and motto on the streets during public holidays. The piñata is another fun item. Piñatas are suppose to come from China to Italy and Spain and then to Mexico during the Spanish colonization. Spanish catholic priests introduce the idea of breaking the piñata in the festivities just before Christmas. The original piñata had seven-cornered points which represented the seven capital sins. 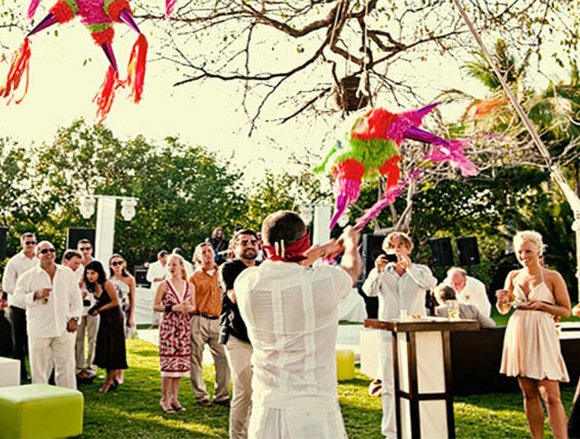 Today piñatas are used by parents in children birthday parties. Although piñatas are made in whatever shape, specially cartoon characters, the original seven-cornered shape is still the most popular. They make great decorations and also can be fun to play and break the piñata in an adult party. 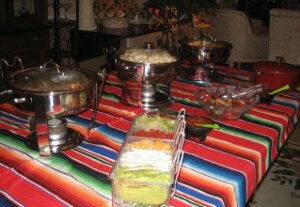 If you have other ideas for Mexican party decorations please leave us your comment below. Thank you!